UTM XCITE arranged an event aimed at nurturing the creative heads in UTM in entrepreneurship skills. A recent report noted that UTM XCITE organized a two-day program in late February 2019 that included a workshop and hackathon. The program aimed to teach 39 participants from UTM unique marketing skills and branding solution tool the software developed by an American technology and camera company; who also owned one of the world’s most popular social media platforms. The aim of the program was to nurture creative heads in UTM in entrepreneurship skills. The workshop also taught the application of AR in the industry where the aim was to help them see the correlation and opportunities that they can benefit from using the skills. The workshop was divided into two sessions, the software training sessions in the morning followed by Business Model Canvas and Value Proposition Canvas in the afternoon. The morning session was handled by two UTM Alumni. Their start-up company, despite only working in the technology for about a year, has already been crowned Official Lens Creator in Asia for the social media platform. The start-up’s founders, an alumnus from Faculty of Engineering and Renuga Nair, from Faculty of Science, taught the participants how to use Lens Studio to create their very own AR lens that can be used with the media platforms applications and their applicability as branding and marketing tool. The second session was led by the deputy director of UTM XCITE (the university’s Entreprenurship Unit) along with two experts from the Azman Hashim International Business School (AHIBS). 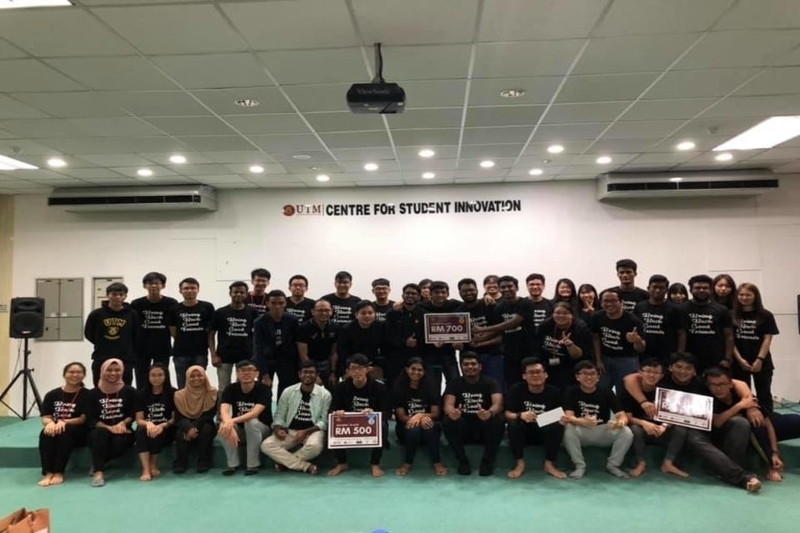 They introduced the concept of Business Model Canvas and focused on Value Proposition Canvas to help them tackle the problem for the hackathon next day whereby the participants had to help create a branding and marketing solution for Nescafe UTM to improve their branding awareness among UTM-ians. During the hackathon, all the participants were placed in groups and started working on their solutions and products in which they had to present and demonstrate their creation in front of the judges. The winners won cash prizes of RM700, RM500 and RM300 respectively along with special discount cards provided by UTM’s café and an opportunity to have their products as part of the café’s marketing tools. According to the National Policy on Industry 4.0, on-going technological transformation necessitates that the way we live and work must be fundamentally changed. While it is difficult to predict precisely how this transformation will impact different industries and countries, it is known that this transformation is unlike anything the world has seen before due to the sheer pace and breadth of these changes. Many see these changes as an ushering of a new era of growth, change and opportunity. The ramification these changes bring for manufacturing firms is forcing nations and governments to re-evaluate how the manufacturing industry operates and contributes to economic growth. Nations are now increasing their focus on developing advanced manufacturing capabilities by investing in high-tech infrastructure and quality education. These are done by facilitating the transformation of the manufacturing industry to the next technology frontier and raising their economic wellbeing. Hence, Malaysia must follow suit if it wants to remain competitive. Thus, the Government is working to strengthen the digital connectivity in and between industrial, education and training hubs to remove connectivity bottlenecks in adopting Industry 4.0 technologies. This will increase awareness of the need, benefits and opportunities of Industry 4.0 technologies and business processes among manufacturing firms (and in marketing as well). One of the strategies the Malaysian government is using to its citizens meet the challenges of a new technological era is ensuring the availability of future talent by equipping students with the necessary skillsets to work in the Industry 4.0 environment.